"I’ve got a bad feeling about this..."
It’s May the Fourth, aka Star Wars Day! D’you know what that means? It’s time to put on your favourite Star Wars t-shirt and bust out some of the best Star Wars quotes, ready for you to annoy your friends, families, and colleagues. It’s already one of the most quotable movie franchises ever – and shows no signs of slowing down. From “Do or do not, there is not try” to the misquoted mic drop that was “No, I am your father”, Star Wars quotes have followed us around for decades now. In fact, there’s so many that reducing it down to just 20 was a Death Star-sized task in and of itself. Everything from 1977’s A New Hope through to 2017’s The Last Jedi has something to say here. There’s put-downs, puns, and plenty more in-between. The movies may be remembered for their Leias and lightsaber battles, but it’s the words that will live longer in the memory. 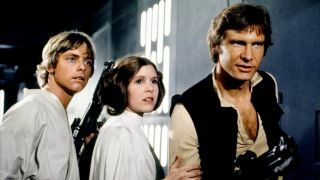 Here to inspire; here to embrace; here to make you laugh and cry in equal measure: these are the best Star Wars quotes from a galaxy far, far away – until the barrage of new Star Wars movies put more words in your mouth, that is.